Redesigned for 2018 the third generation of the Crux Lady boasts modern styling with a lighter more contoured toe rand. The upper of the Crux is made from a 1.8mm Suede, subtle for comfort yet exceptionally durable. Coated in a Durable Water Repellency (DWR) to improve water resistance, the upper is capable of shedding off rainwater in light showers. The Crux features a Vertical sole unit produced by the world renowned manufacturer Vibram, the unit features a specific toe climbing zone to provide additional stability whilst perching on rock lips on a climb. The Vibram Vertical sole is made from Vibram Megagrip, a high performance rubber compound that that offers exceptional grip on both wet and dry surfaces, ideal for ever changing ground conditions. A tough EVA midsole and forefoot cradle system will provide unparalleled support and confidence in every foot strike. Lacing runs all the way down to the toe-box to allow for personal customizability. The updated rand on the toe-box provides protection from sharp rocks, adding to the durability of the shoe. 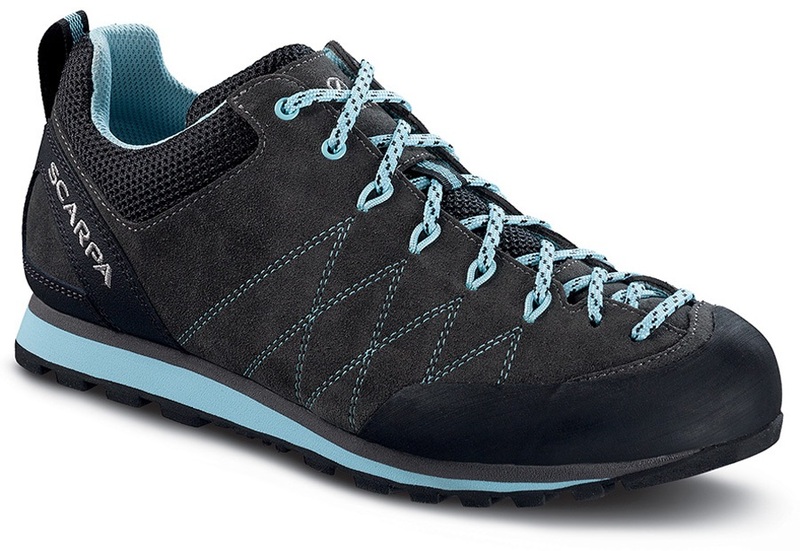 Constructed to provide day long support and promote true pronation on the approach whilst being fully capable for low grade scrambles the Crux Lady from Scarpa is ideal for the climber or hiker looking for an adaptable shoe.